I used to care so much. I used to fight for this. I tried my hardest to hold on and keep you but you didn't want this as much as I did. 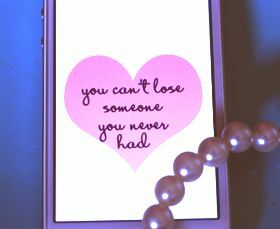 I didn't lose you. Let's be honest, you lost me. yeah..it's nice...it's something like this --- "I LOVED YOU A LOT,I GAVE MY CORE INTO YOU ...BUT YOU JUST THREW ME AWAY..ITS HURTING VERY BAD..."
Leaving someone when you care deeply about someone can be the toughest thing to do. When you lose a best friend, it's worse then breaking up with a boyfriend. Because you lose more than a heart, you lose a little bit of yourself. Losing someone is difficult, yet a part and parcel of everyone's life. In our lives we all have our kith and kin. We all have a core group of people quite close to us. Such is the bond between them and us that we don't ever want to part ways from them.At times we are but forced to part from our friends, family members, beloved etc. A multitude of reasons can be there behind the same. Death, mutual differences and relocations are some of the most prominent ones. Amongst all of these reasons losing someone to death is perhaps the most tragic one, yet inevitable. In no time we are suddenly faced with the terrible realization of our special someone being no more with us. It takes some time to come to terms with this bitter truth. So often we end up losing someone on account of our mutual differences with them. Differences that we feel cannot be sorted out and are enough to put an end to our relation with someone.